Jerk Chicken w/ Cucumber Mango Relish & Roasted Ranch Potatoes — Happy Food Co.
WHISK together the jerk seasoning, apple cider vinegar, and TWO olive oil packets in a glass baking dish. SEASON the chicken breasts with salt and pepper and place them in the baking dish, coating both sides generously with the jerk marinade. PLACE the baking dish in the refrigerator for about 10 minutes while you prepare the potatoes. SLICE the potatoes in halves or quarters (depending on the size of the potato) on cutting board. TOSS the potatoes with the remaining olive oil packets and the ranch seasoning on baking sheet. ROAST in the oven for 30 minutes or until golden and tender. REMOVE the chicken from the refrigerator and slide the baking dish into the oven with the potatoes. ROAST for 15–20 minutes or until cooked through (no pink inside). 4. MIX THE RELISH, SERVE & ENJOY! 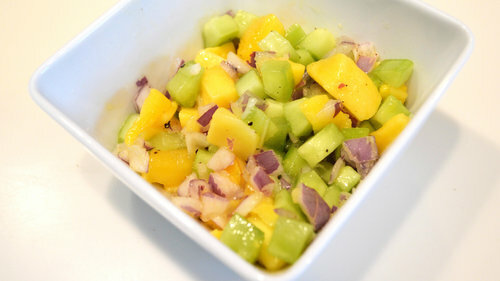 COMBINE the cucumber, mango, onion, champagne vinegar and blood orange olive oil in a small bowl. SERVE the jerk chicken with relish on top and the roasted potatoes on the side. ENJOY and pat yourself on the back for preparing such a fresh and tasty meal! This medium bodied wine has a finely balanced acidity with a long, clean, crisp finish. 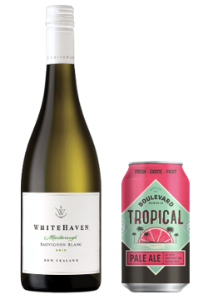 Offers aromas of blackcurrant leaf, nettle and jalapeño with notes of grapefruit, guava, and passion fruit.